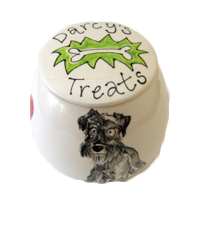 All our luxury puppy treat jars are handmade to order for us here in England. We have a range of patterns and colours for you to choose from and you can also buy a matching dog bowl. Choose from paw prints, stripes or spots in either blue, lime green or peach. Our ceramic puppy treat jars can also be put in the dishwasher. Keep all your puppy’s treat safe and fresh in one of our luxury puppy treat jars. Each uniquely handmade to order for us here in the UK, our puppy treat jars come in a great selection of colours and patterns that will look great on your kitchen counter.